If you want to grasp how much the pecking order among top foundations is likely to change in coming years, spend some time scrolling through Forbes' list of the world's billionaires. There are now 37 U.S. billionaires on the list with assets greater than the Ford Foundation, the largest U.S. legacy foundation, which last reported an endowment of $12 billion. Some 150 billionaires have assets greater than the Rockefeller Foundation, which has assets of around $4.3 billion. Once you're done perusing the Forbes list, take a look at the Foundation Center's list of the top 50 foundations, the great majority of which are legacy outfits like Ford endowed by donors who've passed from the scene. Only 14 of the entities on this top 50 list held more than $5 billion in assets in 2014. But it's a fair bet that the list is going to look dramatically different some years from now, as foundations endowed by top living donors come to dominate the upper reaches of institutional grantmaking. Indeed, if your criteria is annual giving instead of assets, such a shift is already well along: Foundations fueled by living donors, including community foundations, accounted for half of the top 20 U.S. grantmakers in 2014. That share would almost certainly be greater if 2016 data were available. Many of America's top billionaires have signed the Giving Pledge. Others have not, but plan to give away most of their wealth. George Soros is a case in point: He hasn't signed the Giving Pledge, but has long made clear his intention to leave the bulk of his estate to the Open Society Foundations. Now, we know for sure that Soros has made good on that promise, with the revelation yesterday that his foundation holds $18 billion in assets—making it larger than Ford by a third, and the second-largest U.S. foundation after Gates. The large-scale transfer of assets to the foundation has been happening quietly for a while, so it's not like OSF got super-sized overnight. As of 2015, the two main Soros philanthropic entities—the Foundation for an Open Society and the Open Society Institute—held around $10 billion in assets. Also, as I've noted in the past, OSF was already the second-largest foundation in the U.S. based on outlays, with a budget of over $900 million a year. In other words, for a long time, Soros has been making money far faster than he can give it away, even as OSF has blown through nearly a billion dollars annually over recent years and Soros' lifetime giving tally has soared to $14 billion. No wonder he gave up on "giving while living." That OSF is now endowed with so much wealth will be deeply reassuring to the people, organizations and grantees that are part of this vast philanthropic archipelago, which has outposts in nearly 40 countries. The sun never sets on the Soros Open Society empire (an oxymoron, I know)—nor will the money ever run out. In fact, it's likely that the pile of wealth under OSF's command will only grow in coming years. Soros is expected to transfer further assets into his charitable vehicles, but those assets will continue to be managed by his private investment fund, Soros Fund Management—with the potential to achieve high returns thanks to the kinds of successful bets that Soros and his team have made in the past. All that said, progressive groups in the U.S. shouldn't expect any big bump in support any time soon. The foundation says there will not be any near-term expansion of grantmaking or programs. There are a lot of mouths to feed in the OSF family worldwide, and the organization's annual budget of over $900 million already amounts to about 5 percent of its $18 billion in assets. The big concern concern regarding OSF is not about its finances, though. It's about its leadership and governance. The House of Soros is a complicated place with competing power centers held together by a benefactor who's now in his late 80s and won't be around forever. OSF's outgoing president, Chris Stone, has done heroic work to bring more organization and coherence to the foundation. But his abrupt dismissal last month from one of the toughest jobs in philanthropy underscores the challenges that remain in creating a fully professionalized OSF that will endure and thrive in a post-Soros era. 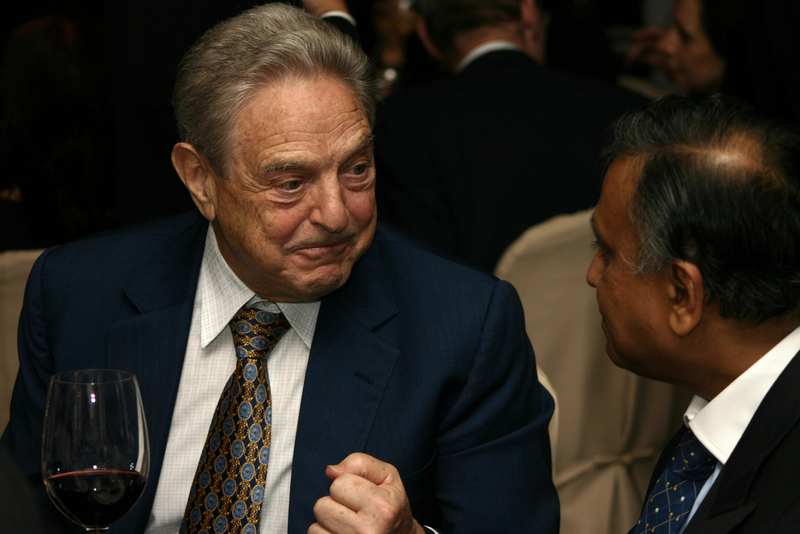 On a separate note, the news that OSF now controls the bulk of Soros's fortune is sure to be unnerving to those who don't share the billionaire's policy goals. Progressives need only to close eye their eyes and imagine their own reaction if or when the Charles Koch Foundation comes to have an $18 billion endowment—all dedicated in perpetuity to supporting libertarian and conservative goals. In fact, the future Koch philanthropic war chests could well be much larger. Today, David and Charles Koch have a combined net worth of $97 billion. Neither has said much about their charitable endgame. But whatever it is, it's likely to be deeply rattling to progressives. Imagine think tanks like the Cato Institute, which the Kochs helped found, receiving billion-dollar endowment gifts. Meanwhile, any number of other billionaires have been getting more focused on bigger giving—and many have major ambitions to shape public policy. Cheerleaders of philanthropy will say this is all good news, that pluralism is getting a major boost as larger funds flow to civil society to amplify a wide range of voices. That's one way of seeing it. Another is that we're looking at a future when public life will be increasingly choreographed by the holders of private wealth. Related: What Just Happened at the Open Society Foundations? And What Comes Next?